Univision's MLS Friday night is moving though 2015 calendar right along side ESPN and Fox Sports 1 as part of the recently signed television package. 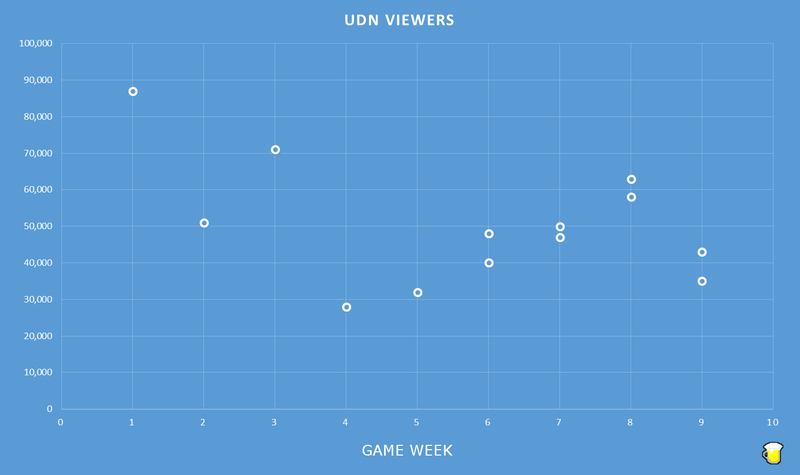 So far I've tracked 9 game weeks and 13 games, which gives me a good feel for how things are going at UDN. Games are averaging 50k viewers a match (48k median). Similar sports programming across all sports channels during this Friday night window average around 225k. 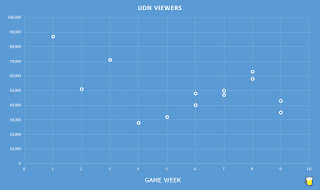 Modest numbers as far as the broader English speaking sports world goes but they are good for UDN, who has a smaller reach then some of the other sport stations on satellite and cable packages. While it's expected that Liga MX games should draw more (they do, + 10x more) it's important to not that there is an obvious trend upwards that I'm sure the marketers with both MLS and UDN should be happy to see (last weekend aside). Similar stories aren't being told over at Fox (good numbers on average but no trends either way and ESPN (nothing doing here yet, bad).